Anybody looking for the definition of trust will find plenty of answers online: Among other things, political scientists and sociologists question how institutions gain our trust, economics tries to sound out confidence-building measures with regards to entrepreneurial success and psychology takes on the question of how trust can be built up, for instance in oneself or one’s partner. Despite all sorts of challenges, most Europeans are prepared to rely on others. This applies both for their fellow human beings and also for various sectors of the economy, with the amount of trust placed in people often clearly higher than that placed in organizations, for example companies. Differences in trust levels also start to materialize when individual countries are compared. 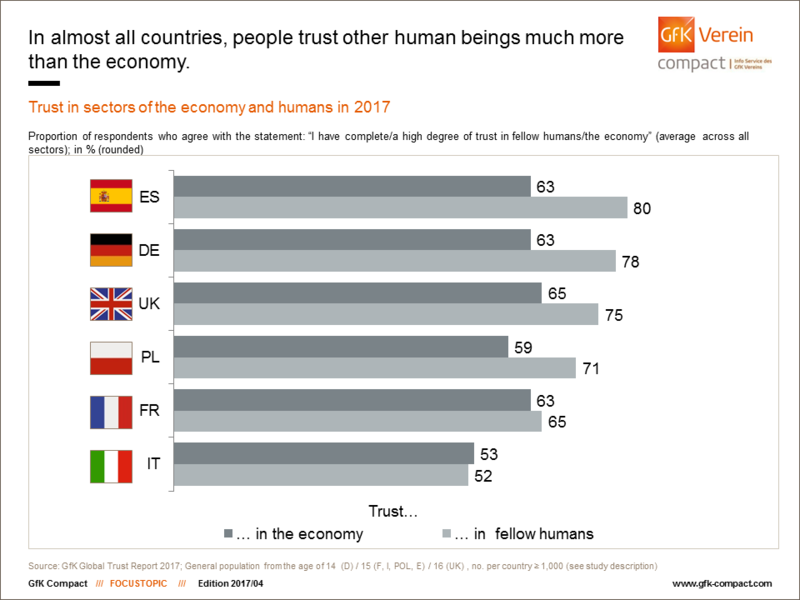 Looking at a selection of European countries, one thing becomes clear: In most instances, the trust which humans place in other people is higher than that placed in the economy. Only in Italy are the two values almost the same – in fact with different sectors even being slightly ahead. 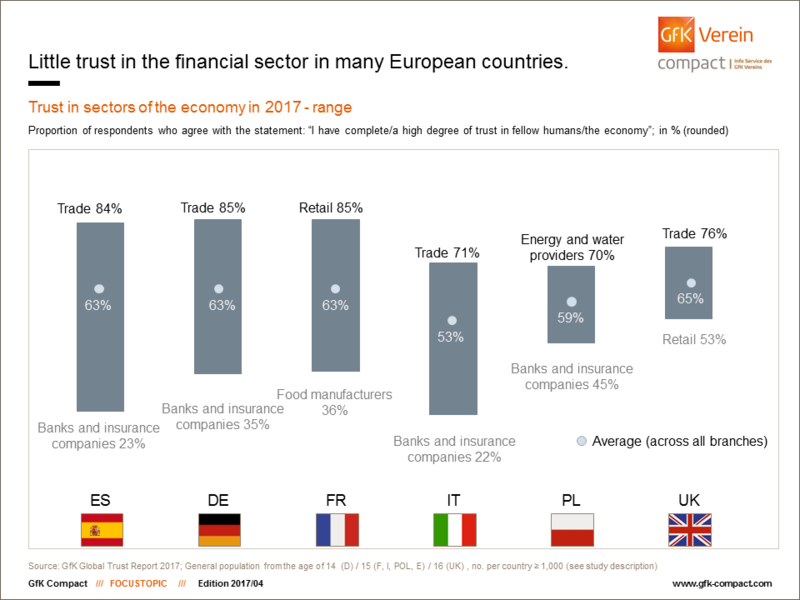 This is revealed by current figures from the GfK Global Trust Report 2017, for which over 28,000 people were surveyed globally last year, with more than 7,000 people in Germany, France, Italy, Poland, Spain and the UK between September and November. Spaniards trust those around them the most: 80% stated the view that their fellow human beings could be relied upon fully or to a great extent. In terms of the economy, this trust is only felt by 63%. As such, this country, which was shaken up by the effects of the economic crisis not too long ago, sees the biggest gap between the two areas, at 17 percentage points. The results are similar among Germans: 78% trust other citizens compared with 63% for the economy. In the UK, three quarters of respondents place great trust in those around them, whereas this figure is 65% when it comes to the economy. In Poland, the difference is slightly more noticeable: 71% trust other humans, while 59% trust various industries. Countries in Western Europe, specifically France, seem to be slightly more cautious than other countries. Yet the French do not differentiate much between private individuals and companies: 65% have faith in their fellow humans, with this figure being 63% for the economy. The Italians are the most parsimonious with their trust. A small majority place their trust both in the economy and in other people (53% and 52% respectively). Our willingness to trust is affected by whether we are dealing with real people or companies. However, there are also differences between individual sectors of the economy. There is still a lack of trust in the financial sector in most countries. It is consequently unable to keep up with the high values of other industries, as seen by the range of trust levels. This gap is especially large in Spain: While just under a quarter of respondents place their trust in banks and insurance companies, a clear majority of 84% feel that they can count on the services of tradesmen. This difference of 61 percentage points represents the largest discrepancy. It is slightly smaller in Germany, at 50 percentage points: 35% of Germans feel that they can rely on the finance industry, compared with 85% when it comes to trade. The situation is similar in France as well, although different protagonists hold the highest and lowest places in the rankings: 85% have confidence in retail, but only 36% trust food manufacturers. The gap between the most and least trusted is just as large in Italy. While banks and insurance companies are trusted by 22% of respondents, 71% place their trust in tradespeople. The divide is much smaller in Poland and the UK, with a difference of 25 and 23 percentage points respectively between first and last place. In Poland, energy and water suppliers are at the top of the list with 70%, but the financial sector trails behind in last place with 45%. The majority of people in the UK place their trust in trade, with 76% feeling positive in this respect. However, at 53%, retail is in last place, although it still enjoys the trust of the majority of UK respondents. Europeans rated a total of 14 sectors of the economy in terms of their degree of trust. Some were ranked for the first time, but most had already appeared in surveys from previous years. Whether a sector ranks highly for consumers’ trust clearly depends to a great extent on a country’s political and economic situation. While the average level of trust across sectors of the economy in the UK, Spain, Germany and France is over 60%, this sinks to 53% in Italy. With an average of 59%, Poland is mid-ranking. In the UK, which has the highest average of 65%, people’s trust is relatively even across individual sectors and there are limited differences. With a 74% trust ranking, clothing and shoe manufacturers come in second place behind the favorite – trade – and are closely followed by airlines, the electronics industry and cleaning product manufacturers, with 72% each. Energy and water suppliers, toy manufacturers, the pharmaceutical sector and food manufacturers also receive good rankings, each benefiting from the trust of around two thirds of respondents. Software and PC manufacturers as well as the automotive industry also reach the 60% mark. Telecommunications providers and the financial sector follow closely behind, with a good rating from the majority, at 57%. Retail brings up the rear, with 53% of all respondents seeing this sector as very trustworthy. Spain is the country with the largest differences in trust. In addition to trade, Spanish respondents rely on retail most of all, at 78%. Clothing and shoe manufacturers are also rated just as highly at 78%, followed by detergent manufacturers and the toy industry (74% and 73% respectively). Food manufacturers, airlines and manufacturers of consumer electronics and household appliances also fall within the top tertile of the trust ranking. Drug manufacturers and the computer sector are trusted by 60% and 62% of Spaniards respectively. The automotive industry enjoys the trust of the majority, at a rating of 59%, while one in every two people feel that they can rely on energy and water suppliers. In contrast, the telecommunications sector is only trusted by 43% of Spaniards. Banks and insurance companies come in last place with 23%. France is generally seen to be a country of fine cuisine and its inhabitants as connoisseurs of many types of delicacies. However, the French are not convinced by food producers. Only a third of the population stated that they trusted this sector of the economy greatly, putting it right at the end of the scale. Conversely, retail (85%) and trade (82%) are at the top of the rankings, followed by airlines (78%), toy manufacturers (71%), with energy suppliers and the IT industry both at 68%. The automotive industry and consumer electronics and household appliances are also managing to keep up with these sectors, with both enjoying the trust of 67% of French inhabitants. A total of 62% of French respondents offered a positive view of the fashion industry, with detergent and cleaning product manufacturers gaining the trust of almost as many. In contrast, almost half of respondents (49%) trust drug manufacturers and 44% trust telecommunications and internet suppliers. Approximately a third of consumers feel that they can rely upon the financial sector, which comes in just above the food industry in the rankings. In Poland, people are more cautious when it comes to putting their trust in the economy: The leading sectors – energy and water suppliers as well as trade – are given values of 70% and 68% respectively, followed by the clothing industry (66%), detergent manufacturers (65%) and games consoles, washing machine and dishwasher manufacturers (63%). Retail, the pharmaceutical industry, computer manufacturers and the automotive sector also receive figures around the 60% mark. The majority of Polish respondents also trust telecommunications service providers and the food sector. However, the same no longer applies for airlines, which now have a trust level of 48%. This brings it just above the financial sector, which is trusted by 45% of Polish respondents. As with the Poles, the Italians are slightly more reserved when it comes to their trust in the economy. A total of 71% of Italian consumers trust tradespeople, placing the sector right at the top of the rankings. The country’s reputation as a Mecca for fashionistas is underlined by the fact that almost two thirds of Italian respondents trust clothing and shoe manufacturers. This places the industry second in the rankings. In total, 60% rely on consumer electronics and household appliance providers, with almost as many placing their trust in detergent manufacturers (59%), airlines (58%), toy manufacturers (57%) and retail (56%). A small majority feel that the can rely upon the IT industry (53%) and the automotive industry (51%), followed by energy and water providers (50%). In contrast, the pharmaceutical industry, telecommunications service providers and the food sector fall just short of the 50% mark. However, they are still way ahead of the the poorest performers – banks and insurance companies – which are trusted by just 22% of people. This shows that this sector clearly has the worst reputation in comparison with other countries. In Germany, there is a little more trust placed in banks and insurance companies than in Italy. Despite this, these institutions still bring up the rear of the scale, although this sector of the economy has suffered no further losses. Currently, 35% of respondents trust the banking sector. In 2013, this figure was 29%. Finance falls quite a way behind the top-rated sectors. As such, like in previous years, most Germans feel that they can rely upon trade (85%). Clothing and shoe manufacturers follow behind with a significant gap of 11 percentage points. This was the first time that this sector was included in the survey. It was immediately able to secure second place. At 73%, airlines are also in the good graces of consumers, benefiting from a level of trust which has remained stable for years. In contrast, consumer electronics and household appliance manufacturers suffered slight losses: 78% of consumers placed their trust in this sector in 2013, whereas this figure now stands at 72%. With 70%, detergent and cleaning product manufacturers were another newcomer in the upper half of the rankings. These were level with retail, which also achieved 70%. Energy and water suppliers are hot on their heels, registering the largest increase in rating over time. Clearly, the efforts of the energy revolution have had an effect. From 2013 until today, the trust level here increased by 18 percentage points. The third sector of the economy appearing in the study for the first time was mid-ranking: Toy manufacturers are trusted by 64% of people, with the pharmaceutical sector almost reaching this figure too (60%). 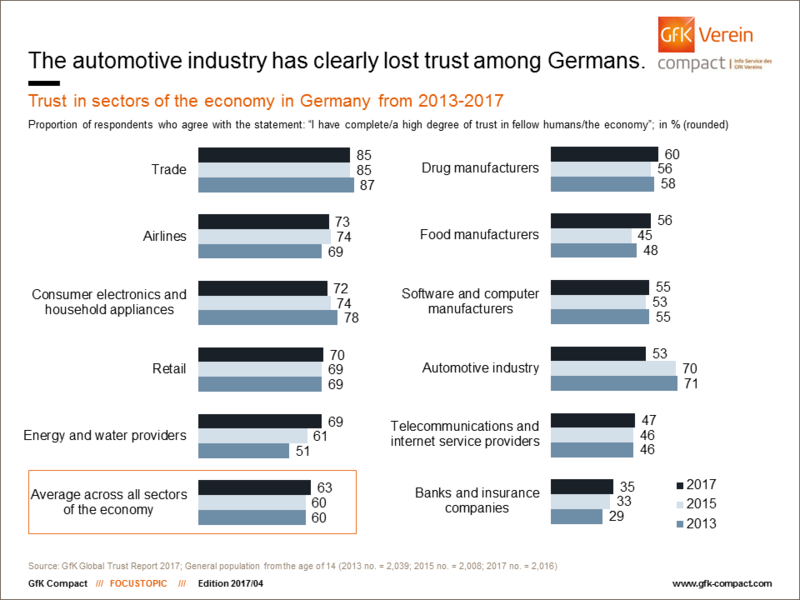 At 56%, food manufacturers are also able to count on the trust of the majority of Germans for the first time since 2013, followed by software and computer manufacturers with 55%. In contrast, the value for the automotive industry has now fallen the most in the rankings: After receiving a trust level of 70% in 2013, the sector fell by almost 20 percentage points following the emissions scandal. Only telecommunications service providers (47%) and the financial sector (35%) fare worse. Gaining trust – but how? If you have any queries, please contact Claudia Gaspar (claudia.gaspar@gfk-verein.org) or Ronald Frank (ronald.frank@gfk-verein.org).